It was perhaps on this date in 317 that the half-brother and successor of Alexander the Great was put to death, just another casualty as the conqueror’s vast empire fragmented. The half-witted Philip III Arrhidaeus (or Arridaeus) didn’t exactly seem like he was born to rule — or maybe he was and that was just the problem. Plutarch juicily speculated that the boy was muddled intentionally by the snake-worshiping wife of Macedonian conqueror Philip II, Olympias. Olympias was the mother of a kid named Alexander whom she was trying to advance to the throne ahead of his half-siblings; Angelina Jolie made an apt choice to depict her at her ruthless harem-politicking best. Arrhidaeus was the son of Philip by a courtesan named Philinna, a woman of low birth. His deficiency in understanding was the consequence of a distemper, in which neither nature nor accident had any share. For it is said, there was something amiable and great in him, when a boy; which Olympias perceiving, gave him potions that disturbed his brain. Philip III Arrhidaeus is one of the main characters of this historical novel. Whatever potions Olympias did or did not administer, she did in fact put her kid in line to follow Philip; that boy vindicated the succession by rolling his phalanxes over vulnerable potentates from Hellas to India. You might have heard of the guy. The problem for Macedon as for Arrhidaeus came after Alexander the Great’s brilliant career closed with his unexpected, youthful death. The stupendous empire had no obvious heir, and different factions of Alexander’s military backed different candidates. Long story short, the Arrhidaeus succeeded as the titular, but powerless, king, under a succession of regents who were prone to untimely deaths. “Merely” titular kingship is a pretty powerful post in itself, though, and Arrhidaeus’s wife Eurydice began maneuvering to gain a wider sphere of action from her now-allied, now-enemy regents, who were themselves fighting one another. In 317, Eurydice backed the wrong horse, and she and the hubby were put to death after capture by his rival, who was at the time allied with Olympias. Alexander’s empire was fracturing, and would soon come completely apart (one of Alexander’s generals founded the Ptolemaic dynasty of Egypt, which ended with Cleopatra‘s asp). It was a dangerous environment for everyone within a pikestaff of power, which meant that at least Arrhidaeus and Eurydice could take solace from the next world when the very same fate befell Olympias herself. The funerary tumulus at Vergina, one of Greece’s most spellbinding archaeological treasures, features an in situ tomb whose occupant — though grandly claimed to be the more impressive Philip II — might, in fact, be Philip III. The contents of this tomb have been the subjected of spirited academic, and even nationalist, disputation, on which topics this blog is blessedly destitute of authority. 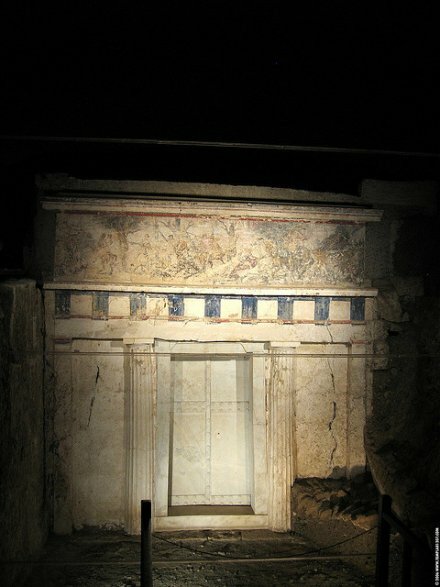 Royal Macedonian Tomb, Vergina. (cc) image from Templar1307 (whose user ID alludes to another blog-worthy incident).